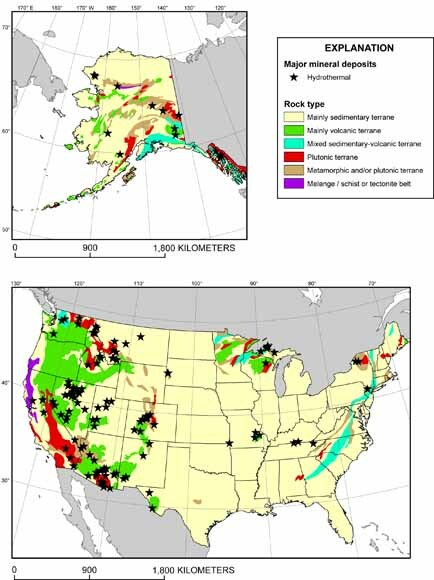 This report, which is one of a series of reports summarizing the World’s endowment of nonfuel mineral resources, describes the location and general geologic setting of deposits of major mineral commodities in the United States. The discussion in this report focuses on those commodities produced in the United States that constituted at least 5 percent of global production or global reserve base in 2003 or had at least $100 million production value in 2001. The discussion for each commodity begins with a brief description of the chemical and physical properties of the material and how it is used. The importance of the commodity in the United States relative to the world is also presented. However, most of the discussion emphasizes the geology of mineral commodities - the important mineral deposit types, their geologic setting, and the processes that led to their formation. A compilation of almost 400 major mineral deposits in the United States is included as an appendix.